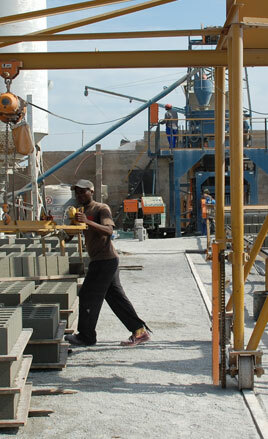 Zikhona Bricks is a cement brick and block manufacturing company based in the Markman Industrial area, Port Elizabeth. The name Zikhona Bricks has been synonymous with exceptional quality for the past eleven years of operation, and we are proud to be the first brick and block manufacturer in the Port Elizabeth area to have many of our products carry the SABS (SANS 1215) mark. We manufacture a range of products which caters for the RDP market right through to townhouse complexes and shopping centers, and have to date manufactured and supplied well over twenty million blocks shipped to various parts of the Eastern Cape, making Zikhona one of the largest manufacturers in PE, by volume. Zikhona caters for residential, commercial and industrial developments on all scales, and were the proud supplier of bricks for Nelson Mandela Bay´s magnificent 2010 World Cup Soccer Stadium.